PolySpaze are a polyphonic/multi-timbral synthesizer/sampler with 4 voices. Each voice has 2 oscillators, one of them with morphable waveforms and sample playback, a ringmodulator, two resonant 24 dB analog filters (HPF+LPF), a VCA, 2 ADSR envelopes and a random generator. It also has 4 LFO's, with morphable waveforms, that are global. Four effects processors are also present. Each of the effects processors can either be placed as a voice insert effect, or as a global send output effect. 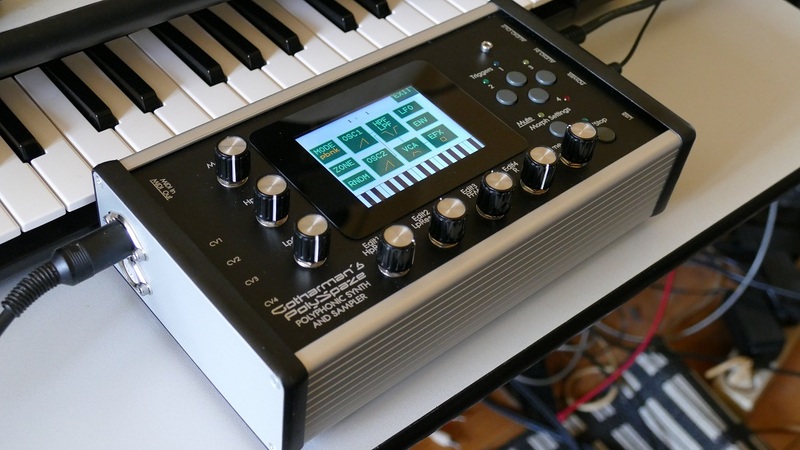 It has a built-in sequencer with 4 note tracks and 8 controller tracks. Notes can be recorded in realtime, or placed in steps on the touch screen. Controller events can be drawn on the touch screen. Different play modes are available. The polyphonic modes lets you adjust the parameters for one voice, which is then polyphonically playable from an attached MIDI device. The FilterBank mode melts all 8 analog filters together, to form a filterbank, with all the parameters of each filter adjustable. Mono mode turns PolySpaze into one big mono synth, with the parameters of all 8 oscillators, 4 ring modulators, 8 analog filters, 4 VCA's, 8 ADSR envelopes, 4 LFO's and 4 effects processors separately adjustable. In multi-timbral mode, the 4 voices forms 4 different synthesizers, each with their own settable key range and MIDI channel, and like in mono mode, the parameters of all the sound building blocks are separately adjustable. For playback and tweaking of stereo samplings, a dual filterbank stereo mode is available. 4 stereo samplings can play back at a time, and the left and right channels are routed through each their own set of 4 analog filters. The Morph function lets you create 2 different layers of sounds and sequences, and morph smoothly between these, using the Morph knob. 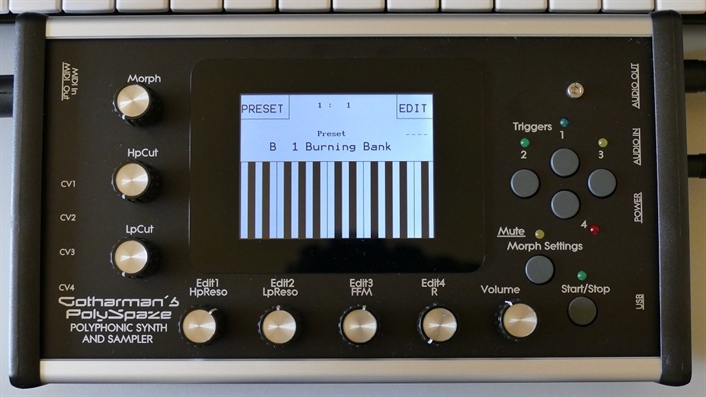 Performance controls includes Touch Screen Keyboard, 4 trigger buttons, the Morph Knob and 6 Quick Edit knobs, with 4 of them being assignable. -2 Oscillators (8 total). Osc1: Morphable waveforms, samplings, FM to Osc2, PWM. Osc2: Sine, tri, saw, pulse and noise. Sync to Osc1, PWM. -2 analog filters (8 total): 24 dB HPF + LPF in serial, based on SSI2144. Both have resonance control and filter FM to Osc2. G-Ray feedback. -1 Ring Modulator (4 total). Between Osc1 and Osc2. -1 effects processor (4 total). Each of the 4 effects processors can be assigned as part insert effect or global output effect. -1 Random Generator (4 total). Trigged by key or LFO. -2 ADSR Envelopes (8 total). -1 Decay Envelope (4 total). -Poly: The 4 voices polypnonic. -Poly Bank: The 8 analog filters forms a filter bank, which the 8 oscillators plays paraphonic into. -Mono: Complete control of all 8 oscillators and 8 analog filters in one huge mono synth! -Multi-timbral: Complete control of each of the 4 voices. 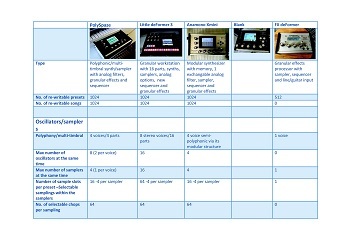 Key range and MIDI channel settable for each voice. -Stereo Bank: Play back stereo samplings through a dual filter bank, formed by 2 x 4 analog filters. -4 track note sequencer, 8 track control sequencer with touch control. -CV in's and out's, and MIDI in and out. 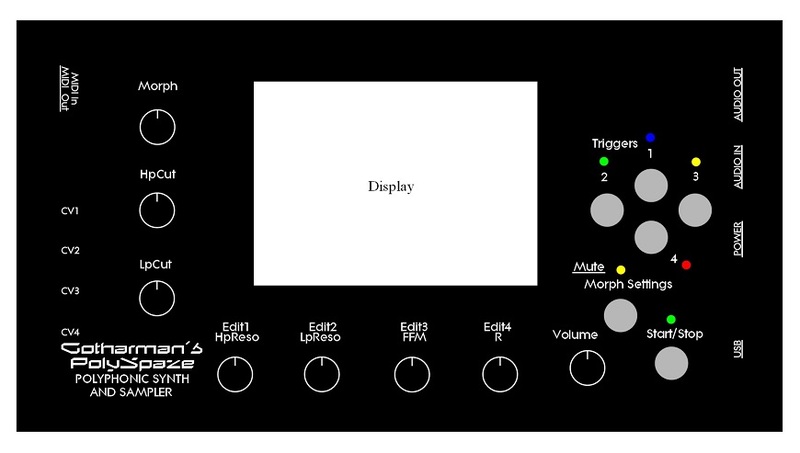 -Touch screen keyboard with Y-axis modulation. -Morphing between 2 layers of sounds. -USB for import/export of wav files and presets/songs, and for updating the firmware. -22 minutes of sampling time / 255 samplings held in NOR FLASH memory. Kept in memory, even when switching off. Each sampling can hold up to 64 "sub" samplings, when the "Import Samplings As Chops" function is used, so the total maximum number of samplings is 16.320 (255x64). -Roland JD-XA MIDI filtering system. JD-XA sends multiple note on's and off's, every time you play a note. PolySpaze detects this, and filter out the unnescessary ones, so you can use your JD-XA as a masterkeyboard. Works with both the internal sound module and the sequencer. -Audio In, 1/4 inch stereo jack. -Audio Out/headphones, 1/4 inch stereo jack. -4 x CV/trigger Inputs (optional). Accepts up to +/- 15 volts. Internally scalable to work in +/- 12 volts, 0-12 volts, +/- 5 volts or 0-5 volt ranges. Minijacks. Intput sample rate: 5 KHz. -4 x CV/trigger Outputs (optional). Range: 0-5 volts. Can output all modulation sources and triggers. Minijacks. Output sample rate: 22 KHz. -Maximum audio latency: 1 sample - 22 uS (microseconds). -Multi voltage input. Output: 9Vdc, 2A, 2.1mm DC plug with positive middle. Exchangable mains plug, so it can be used in any country.